1) Tell us a bit about you and your writing? I love imagining things and making stuff up. Whenever I have a spare minute - right before going to bed, when I'm on the train or waiting in line at the grocery shop - I'm always making up stories in my head. So naturally, those stories have to come out someway. Some of these are just plain amusing, but not really writing-material, but others are. When a story sticks around in my head long enough so that it develops into an actual manuscript, complete with characters, a plot and some nice twists, that's when I know I'm ready to start writing it. The writing process itself usually doesn't take that long. If I have sufficient spare time on my hands, I can write a complete novella in under a week, and a novel in under a month. Unfortunately, I often have time limits due to work, university, etc. and I don't have that much time left to write. Although my first book was situated in the horror genre, and my second book will be as well, there are a lot of other genres I enjoy. I love writing epic fantasy - that's my absolute favorite - but I also enjoy writing paranormal romance, urban fantasy and everything related to supernatural creatures and/or events. 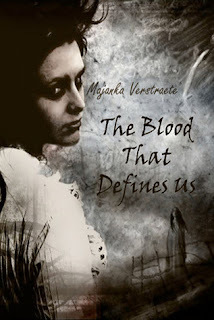 2) Where did the idea for The Blood That Defines Us come from? One of my favorite books ever is Flowers in The Attic by Virginia Andrews. It tells the story of Catherine, Christopher and their two little siblings who are locked up in a small attic for over four years by none other than their own mother. In one of Virginia Andrew's other books in that series, Catherine rebuilds that attic in her own home, although she herself is not entirely aware of what she's doing. That concept, of doing on a subconscious level to your own children was has been done to you by your parents, has always intrigued me. It's part of human nature, but it's an extremely difficult part to understand. Why would you ever put your own children, even if you love them dearly, through the same horror you were put through? That's where my main inspiration for The Blood That Defines Us came from. I wanted to take this concept, and dive deeper into it. I wanted to see what would happen to those people, if those events kept happening generation after generation. 3) Which authors do you think have infuenced your writing the most? I love gothic horror authors like Oscar Wilde, Mary Shelley, Wilkie Collins (The Woman in White, for those not familiar with his work), R.L. Stevenson (Dr. Jekyll and Mr. Hyde) and Bram Stoker. But my work is also influenced by modern-day horror authors like Stephen King and Virginia Andrews, who combines family saga and gothic horror as well. 4) When did you start writing and what has been a highlight for you so far? I've been writing on and off since I was seven years old. My first 'book' ever was a forty-page long story about a witch and a prophecy, and was finished by the time I was eight years old. Of course, it was just something I wrote for fun. I've only gotten serious about my writing the last couple of years, when I felt like my writing skills had evolved beyond the point that I thought my work could be considered for publication. The highlight in my writing career so far has been the publication of my first book, The Blood That Defines Us. The whole experience has been wonderful and amazing, and I couldn't be any happier. 5) When you are not writing, what sorts of books do you enjoy reading? I love a variety of genres. Paranormal romance and epic fantasy are the most prominent ones among them. But I also love supernatural/gothic horror, ghost stories, thrillers, dark fantasy, historical fiction and dystopian novels, in both the young adult and the adult genre. 6) Tell us a little known fact about yourself. What a fun question. Well, when I was younger, I had an imaginary friend who happened to be a vampire. I knew that he was a product of my imagination, but I loved hanging around with him so much that I kept him around. He still serves as a source of inspiration for any vampire characters I write about. Other fun facts are that I'm left-handed, I used to play the clarinet and I'm a recovering Buffy fanatic. 7) What are you working on now? Any new releases soon? I'm currently working on two products. The first is the editing of my second horror novella Mirror, Mirror. The manuscript was accepted by my publisher just about a week ago, and we've been busy editing it ever since. It's due to release somewhere in July 2011, and it has the most gorgeous cover ever, even if I say so myself. The concept of Mirror, Mirror, although somewhat related to The Blood That Defines Us, is entirely different as well. It features a female protagonist, a scary antique mirror and some dreadful secrets. On the other hand, I'm busy writing my first novel-length epic fantasy story. The working title is The Dragon's Apprentice. I have about 40k so far, but things are progressing. I enjoy writing epic fantasy, and this book has been on my mind for a while now, it feels good finally typing it down. I can't really tell you anything more about it at this point, except that it has prophecies, intrigue, sword-wielding heroes, magic and everything you could possibly wish for in an epic fantasy story, along with some original concepts. But stay tuned for Mirror, Mirror. For people who enjoyed The Blood That Defines Us, I'm quite confident this novella will not dissapoint. 8) Where can readers find out more about you and your books? I have a website dedicated to my writing here: http://writings.eternalised.net , but I have to update it more often, or so my publisher keeps telling me. You can also find more about The Blood That Defines Us on my publisher's website (http://evermore.eternalised.net), along with some gorgeous banners. Thank you so much for this interview, Nicki!